Our Land Surveying staff uses cutting edge equipment & software to complete all your projects. In the field we use fully automated surveying equipment such as robotic total stations and data collectors for quick and easy transfer of data to PC’s. We have Global Positioning System (GPS) equipment which allows us to offer other surveying services including high precision surveying, large topo surveys, large boundary surveys, and any other type of land surveying job. In the office we complete 100% of all surveying projects with computer aided design and drafting (CADD) software. Land Development: Residential subdivisions, multi-family developments, commercial development, resort development, mobile home parks, communication towers, infrastructure, etc. Site Plans/Topos: Commercial buildings, office buildings, mini-storage buildings, hospital expansion project, state-leased retail business building, University expansion projects, church facilities, industrial stormwater runoff plans, communication tower sites, airport extensions, industrial access roads, hazardous waste sites, etc. Boundary Surveys: Rural and urban surveys, large tracts (from 80 to 1200 acres), right-of-way surveys, landfills, wetlands boundary surveys, hazardous waste sites, communication tower sites, conference centers, marinas, lake lots, condos, churches, etc. Mapping Control: County Tax Mapping (12+ counties), Resort (2800 acres), City Mapping projects (16, 18, 40, 76 & 120 sq. miles), sand mine (100+ acres), copper mine (48 sq. miles), landfills (40 to 240 acres), Development projects (5 to 800 acres), etc. Construction: County roads, industrial access roads, cellular communication towers, elementary schools, multi-family developments, subdivision roads, restaurants, churches, solid waste transfer stations, airport extension, etc. Consulting: Subcontractor to Engineering, Architectural & Mapping firms. Specialized Jobs: Accident reconstruction survey & drawing, access easement condemnation, landfill quantity calculations, billboard sign permit drawings, highway entrance permits. 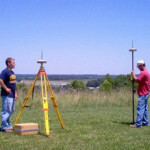 Our land surveyors in Nashville are eager to discuss your surveying needs. 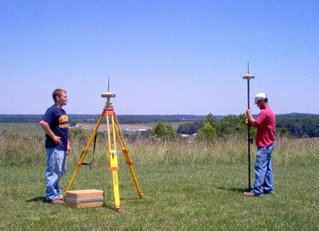 We have experience in all types of land surveying. To talk about your particular survey, please call ​(615) 645-1404 or fill out our contact form to the right.